We believe our quality of service and work is second to none! Welcome to Century Oaks Landscaping! Family owned and operated for over 20 years, Century Oaks Landscaping is a full service landscaping company. Servicing small business owners and homeowners, we provide free estimates and landscaping services for properties in Coventry, Tolland, Mansfield, Andover, Vernon, Rockville, Willington, Manchester, Bolton, Columbia, and other surrounding towns. Call 860-490-7953 today to learn more or to request a quote. Let us do the work so you can enjoy your yard! We will work with you to develop a plan that meets your needs of frequency and includes mowing, weed whacking, and blowing walkways, decks, patios and the driveway for a professional clean look. Our professional crew is trained and takes great pride in keeping your lawn and yard beautiful! We offer our commercial customers a seasonal full service contract that includes mowing, edging, and blowing driveways & walkways for a neat, professional appearance. We also offer mulching, weeding, planting, shrub pruning, and spring and fall clean-up. Contact us and we can discuss a plan to perfectly suit your needs! Licensed and insured for your protection, we believe our quality of service and work is second to none. Our crew is very safety conscious and professional. We are always on time and believe in getting the job done in a timely manner. We understand that you live a busy life, therefore our goal is to get in and out so you can get on with you day. 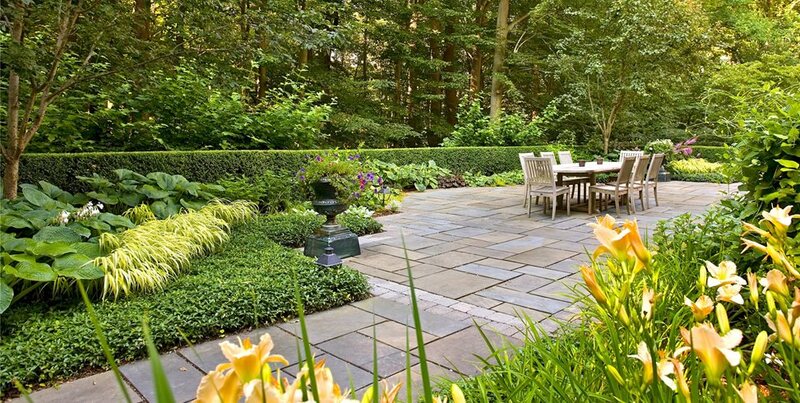 We guarantee that you will be beyond satisfied with our quality of landscaping. Give us a call today! Read more about professional hardscape designs. Learn more about outdoor patios.